LMI produces technical grade sponge rubber suitable for a variety of manufacturing processes, including continuous sponge extrusion compounds. Sponge rubber compounds use a blowing agent to create a cellular structure within the rubber matrix during the curing process. The blowing agent transforms into a gas, generating bubbles that expand the rubber material into a cellular sponge. The cell structure created by the blowing agent also reduces the overall hardness and density of the compound, making it lighter and more flexible. LMI’s history and experience in the development and mixing of sponge compounds has made sponge one of our core product lines, backed by excellent control over incoming raw materials, precise weighment of formulation additives (including the blowing agents) and use of automated control systems throughout the entire mixing process. Contact our technical team to learn more about LMI's sponge compounds. Sponge compounds are often used in applications that require compression and flexibility in creating a seal that cannot otherwise be achieved with solid (dense) rubber or other rigid material. Because of this, a cellular material is a viable option in the engineering toolbox. Before choosing a sponge rubber compound, a compounder must consider what the end use of the compound will be, what kind of properties are needed and whether the required sponge compound will be open-cell or closed-cell. Open-cell sponge has distinct, open cells that are interconnected to neighboring cells. Closed-cell sponge consists of enclosed cells, each with its own independent cell structure. Rubber compounders should also consider what kind of manufacturing process will be used to cure the part (for example, will the material be extruded or molded) to determine what sponge compound will best suit the application. Due to the added variables that exist when processing sponge compounds, design and production quality must be precisely controlled to ensure consistent parts. The formula of sponge materials requires special compounding technique and know-how. LMI's technical team has over 100 years of combined experience in sponge and dense compound design and development and can serve as a valuable resource for your rubber compound mixing needs. Proper design means carefully controlling the ingredients in the recipe that govern the compound viscosity, as well as the compound cure and blow rates. Incoming specifications for the base raw materials such as polymers, fillers and plasticizers should be managed as tightly as possible. The purity and particle size distribution of the chemical accelerators and blowing agents is also critical. In many cases, special grades must be used. After selecting the proper materials, they must be weighed precisely and optimally dispersed during the mixing process, often necessitating the use of chemical dispersions for critical applications. Dispersions allow for clean and accurate weighments, decrease the risk of cross contamination, eliminate the risk of fly loss and speed up the overall incorporation and dispersion into the batch during mixing. The raw materials themselves should be stored in climate-controlled conditions and used within expected shelf life to perform optimally. The size and design of the mixing equipment must be carefully selected to achieve a good balance between dispersion and throughput. In addition, the mixer fill factor and batch size must be optimized to ensure proper contact of the batch with the temperature-controlled surfaces of the rotors and mixing chamber to achieve good dispersion while controlling shear and heat history. Mixers that are too large allow possibilities for poor dispersion and large heat differentials in the batch as a result of inadequate or poor cooling. This can lead to premature vulcanization or scorch. Mixers that are too small generally do not allow for proper economies of scale. The entire mixing process should be well-monitored and controlled. At LMI, a control system monitors almost every aspect of the mixer, including: rotor speed, ram pressure, batch temperature and energy input—critical factors in producing consistent and repeatable mix cycles. Downstream equipment likewise must be properly sized to allow proper cooling and uniform blending of freshly-mixed material while avoiding heat build up. When completed, the material must again be stored in climate-controlled conditions to allow the maximum amount of shelf life. 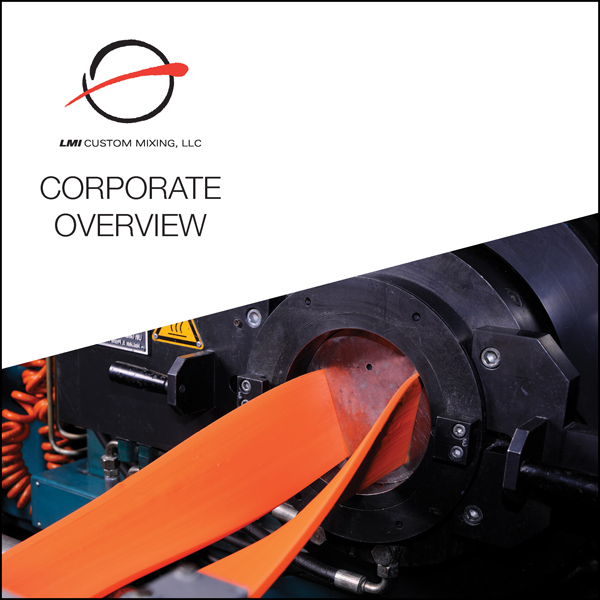 Learn more about our equipment capabilities in our Corporate Brochure.